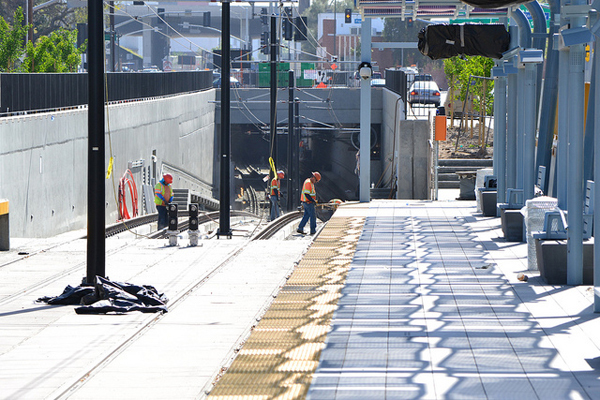 The Expo Line Construction Authority this week posted dozens of new photos of the project as work continues — a target date for opening the line to La Cienega Boulevard is in November. The above pic was taken from the Exposition Park/USC station looking toward the tunnel that carries the tracks under Figueroa. Here’s a link to the rest of the photos. So I guess by the signage it will be the Aqua Line. Actually it will be called the Expo Line and will be represented by the color aqua on the map. I think the line should be called the Santa Monica Line not the Expo Line. Because it will end up in the City of Santa Monica like the Old Pacific Electric Red Car line to Santa Monica Short Line. And the Metro Blue should get a name change to the Long Beach Line. The Mwetro Blue Line goes down the same tracks of Pacfic Electric Red Car Line to Long Beach. Looks like the public won this one by calling it EXPO and suggesting the color AQUA. Even though one of Expo’s ex-board member Parks wanted to change the color and name. I am very proud of the Metro Rail work being done. Although I live an hour from Los Angeles, I have traveled extensively by Metrorail when I was visiting. I have seen mass-transit systems in other nations, and LA certainly has one of the best, as far as quality goes, if not a bit lacking in length. Keep up the good work! I’m pretty sure changing the name of the line and/or color won’t have any effect on ridership or quality of the ride. Unless you call it the puppy-and-freedom-hating line. People love puppies and freedom.